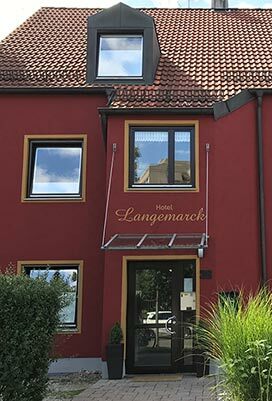 Hotel Langemarck is a centrally-located, owner-run hotel in a quiet setting. We have modern, well-equipped single and double rooms. We’re excellently located with close proximity to the Zentralklinikum Augsburg hospital, the DEKRA seminar building, and the TÜV Süd training center, as well as with quick access to the Augsburg exhibition center. The SGL arena of FC Augsburg is easily accessible by car via the B17 in 10 minutes. Would you like to explore the Augsburg city center? No problem—with public transit you’ll reach the Rathausplatz in about 10 minutes. From there you can easily reach the numerous sights of Augsburg, such as the Fuggerei, the Augsburger Puppenkiste, City Galerie, tourist information, and much more. Of course Augsburg has even more attractions: in the Stadtwald you’ll find the Augsburg Zoo and Botanical Garden, as well as Schloss Scherneck with adjoining climbing garden in the surrounding area, and Legoland in Günzburg. Just ask us, we’ll be happy to give you tips.